PORTLAND — Gray-New Gloucester used size, quickness and a stout defense to claim its second state title in three years. The Patriots defeated Mount Desert Island 43-30 in the Class B girls basketball championship at Cross Insurance Arena on Saturday. Gray-NG also had the been-there-done-that veteran leadership of Bri Jordan, who led the Patriots with 15 points, seven of which came in the final quarter, and nine rebounds. The Gray-New Gloucester Backpack Club is pleased to announce we have been chosen to receive a Drive for Education Program Award from Berlin City for the third consecutive year. Once again this grant give us the financial security we need to stock our food pantry shelves through the end of the school year. The positive impact of this program is far-reaching – affecting the children we serve, the students who volunteer for us, the community members, and our staff as well. Thank you Berlin City for this generous donation, and to all who work hard throughout the year to make it all happen! AUGUSTA — Sen. Ned Claxton, D-Androscoggin, will hold public office hours in New Gloucester. Public office hours provide residents a chance to meet with their elected officials, ask questions, and get help with legislative or state government matters. Additional dates and locations for public office hours throughout Senate District 20 will follow. Senate District 20 includes Auburn, Mechanic Falls, Minot, New Gloucester and Poland. The New Gloucester planning board met on February 5, 2019, with a full agenda, including site plan review of a proposed new home in the Village historic district, a proposal by Pineland Farms for renovations to establish a meat-packing facility on their grounds, and several proposed ordinance changes. New Gloucester’s search for a new fire chief to replace former chief James Ladewig will continue this week with additional candidate interviews scheduled for February 8, according to Town Manager Carrie Castonguay. To learn more about the status of the search and its background, read Ellie Fellers’s full story in the Sun Journal. The Village Coffeehouse is a wonderful, intimate setting to hear nay kind of music and you can bet the Big Nite O’ Blues will continue that tradition. The Coffeehouse is held in the vestry of the First Congregational Church at 19 Gloucester Hill Road. Show starts at 7:30 pm. Tickets $10 at the door. Saturday Feb. 2, 2019. Start the New Year with an evening of acoustic blues and Americana music at the Village Coffeehouse in the Vestry of the First Congregational Church. We are pleased to have Dave Collins back with some new band members and new music. Join friends and bring family to hear Dave Collins – guitar and vocals and formerly of Bluezberry Jam; Rudy Gabrielson – piano, blues harmonica, vocals, and formerly of Bluezberry Jam; Paul Riechmann – stand up acoustic bass and vocals, and Crista Koerber, stand-up bass and vocals. Music starts at 7:30. Admission is $10. 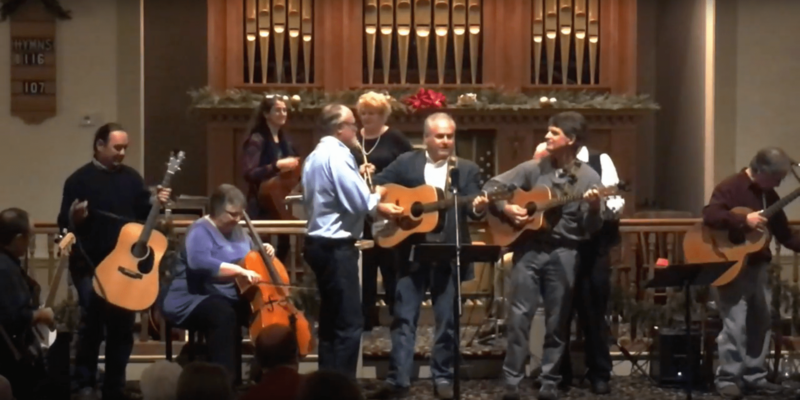 The third annual Christmas concert will follow in the acoustically spectacular sanctuary with musicians from New Gloucester, Gray , and Alfred. A New Gloucester Christmas is a collaboration of many artists from the Greater New Gloucester area. Spearheaded by guitarist Jim Gallant, fiddler Mike Conant, and the members of Bald Hill, this year’s line-up includes a host of new participants, including noted Seussian scholar Don Libby and choirs representing St. Gregory’s in Gray and the New Gloucester First Congregational Church. 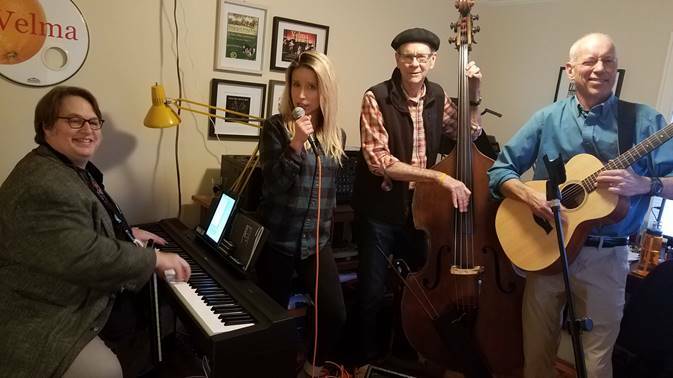 Returning to the stage from previous Christmas appearances are Emily and Steve MacKinnon (of the Kennebunk River Band), George Wardwell, and percussion guru Tony Castro. Show time is 7 pm. The dinner is free and open to the public as is the concert but a suggested donation of $10 will benefit the Church’s Fuel Assistance Fund which helps fund needy families during the Maine winter.